Pests with Feathers… Flock Together? When we think about house hold pests, we think about the creepy crawling ones, and the furry clawed ones, but have you ever experienced the flying feathered ones? Although birds may be beautiful as they sing the songs of spring or fly overhead, migrating to warmer weather, birds can be pests! The most common birds found invading Hamilton households are sparrows, starlings and pigeons. 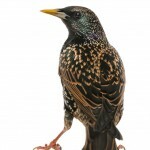 Our feathered friends are not only a risk to the health of you and your family, but can also be responsible for serious damage to the home, whether you are experiencing an unexpected visit from one bird or an entire family. Nests and nest materials can block gutters, downpipes and chimneys which can lead to serious build-up of poisonous gasses and ware down internal and external materials. However the most serious threat birds pose in the home comes from their droppings and feathers. Often these by-products will be carrying diseases and parasites (up to 50 different kinds), not to mention the average acidic content in bird droppings can actually strip paint off the walls! Histoplasmosis – a potentially fatal respiratory disease; results from a fungus in bird droppings. Salmonellosis – a bacteria that often occurs as food poisoning; can be traced to pigeons, starlings & sparrows, bird droppings & dust from bird droppings. Candidiasis – a yeast or fungal infection that affects the skin, mouth, and respiratory system; spread by pigeons. Cryptococcosis – an illness that begins as a pulmonary disease and can later affect the central nervous system; caused by yeast found in the intestinal tract of pigeons & starlings. Because of some of the risks associated with birds, it is important to ask a professional to help you properly clear your home of birds and their by-products. Our bird control technicians will humanely remove all birds, nesting materials and debris (including droppings and feathers) prior to replacing vents or sealing entry points. Along with this service will be a complete cleaning and disinfecting of all contaminated areas in case of odor or any other remnants of the birds visit! The very best solutions are preventative. If your home town has a high bird population there are many ways to protect your house from an uninvited guest. Technicians will work with you to determine if screening, spiking, netting or other barricade methods are best suited to build a bird control system meeting your requirements. This entry was posted in Blog on 2014/11/10 by Any Pest.